Of Rules and Laws and a Man Too Humble for His Own Good. 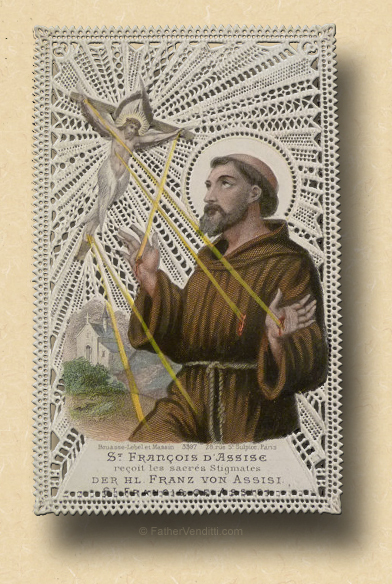 The Memorial of Saint Francis of Assisi. 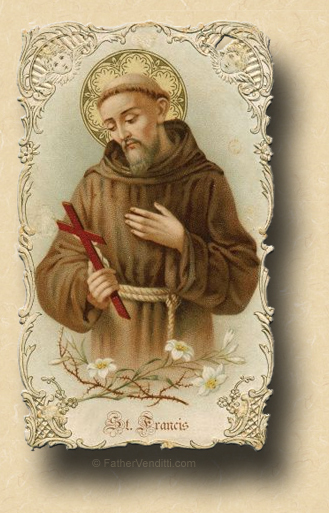 The Third Class Feast of Saint Francis of Assisi, Confessor. 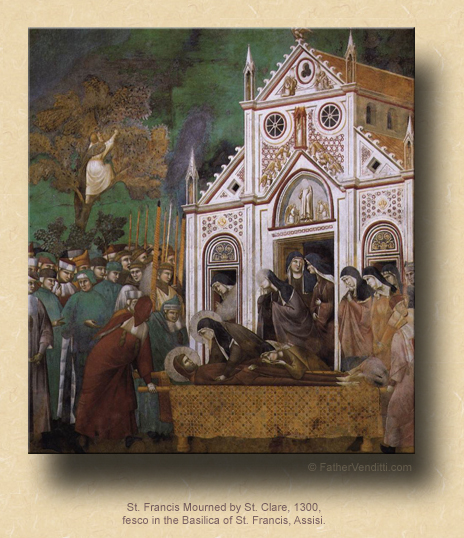 The Twentieth Tuesday after Pentecost; the Feast of the Holy Martyr Hierotheus, Bishop of Athens*; and, the Feast of Our Venerable Father Francis of Assisi. • Colossians 1: 1-2, 7-11. 2:19 PM 10/4/2016 — Many years ago I was blessed—or cursed, however you want to regard it—to take a group of college girls on pilgrimage through France and Italy, and one of our stops was Assisi. During our three days there, I stayed in the monastery of the Conventual Franciscans where the Saint’s tomb in located, and offered Holy Mass at the altar of the tomb. Francis, himself, is a very popular saint, as you know, and it can be confusing sometimes to consider all the different religious communities that claim his name. 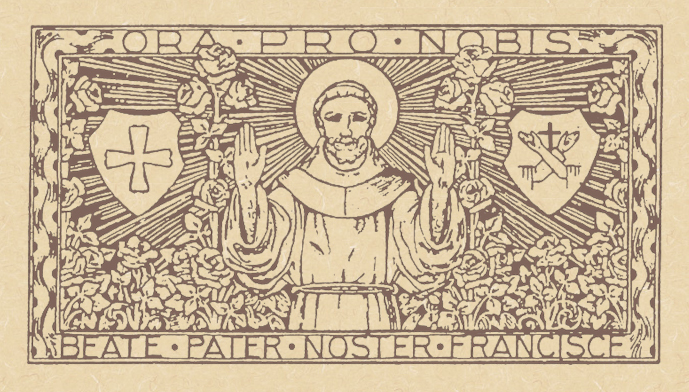 Personally, I recognize only three branches of the Franciscan family: the brown-robed Order of Friars Minor, who believe themselves to be the community founded by Francis; the black-robed Order of Friars Minor Conventual, who actually are the community founded by Francis; and the Order of Friars Minor Capuchin, who never claimed to be founded by Francis. Francis, himself, was an enigma: born of nobility, he completely misunderstood an interior locution he received while praying in front of a crucifix, thinking our Lord wanted him to renovate a crumbling church. Our Lord did, indeed, tell him to “rebuild my Church,” but he meant the whole Church, spiritually from within—which, of course, Francis eventually did. He and his disciples lived a very simple life, but their community was beset by internal struggles from the beginning, resulting in Francis being thrown out of the community he had founded. Part of the problem stemmed from his own misguided humility: he allowed himself to be ordained a deacon so that he could preach in church, but never become a priest; and a religious community that has priests in it must have a priest for its superior. He is, nevertheless, a very popular saint, due primarily to the simplicity of his life and message, which dovetails nicely with what we must now consider as we begin a look at the Blessed Apostle Paul’s Epistle to the Galatians. Your probably don’t remember, but back when we were looking at the Apostle Paul’s activities in Corinth, I had made mention of the fact that what he says about the Faith there he will say again even more forcefully to the Galatians; and, it was in the last verse of yesterday’s first lesson that he said it: “…the gospel I preached to you is not a thing of man’s dictation; it was not from man that I inherited or learned it, it came to me by a revelation from Jesus Christ” (Gal. 1: 11-12 Knox). The point that he's making so forcefully here is that the truth he preaches does not come from any human source, but from God. I didn’t preach yesterday because I was not well, but in today’s lesson, which is the continuation, he goes on to make several points, telling the Galatians that his commission as an Apostle did not have to come from the Twelve in Jerusalem, but rather from his own direct revelation from Christ at his conversion, and emphasizes the point by saying that he did not go right away to Jerusalem to get his “certificate of authenticity,” if you will, from Peter, but stayed for three years in Arabia, during which time he had his run-in with the King of Damascus that he spoke about in his letter to the Corinthians. He did, of course, finally make his way to Jerusalem, as he tells us today, where Peter, over the objections of the other Apostles, confirms Paul's Apostleship; and, with that, Paul is off again to convert more people to Christ. So, he's not wasting any time with the internal politics of Church bureaucracy; he has no time for it. He's on fire with the love of Christ. And this point is punctuated in this lesson by his passing reference to the fact that he, himself, prior to his conversion, was a persecutor of the Church. I'm not sure exactly why he brings it up, unless it's just to emphasize for the Galatians the completeness of his conversion—that they have no reason to doubt his convictions at this point, especially since he now has his “certificate of authenticity” from Peter. Saint John Chrysostom speculates that it may have been to illustrate that such a sudden conversion from such an opposite way of life could not have been possible without the direct intervention of Christ, which would support even further Paul's claim to Apostleship. But what I would like to offer for your meditation today is directly related to the manner of Paul's conversion, and which he, himself, states in the very last line of yesterday’s lesson: “…the gospel I preached to you is not a thing of man’s dictation; it was not from man that I inherited or learned it, it came to me by a revelation from Jesus Christ” (Gal. 1: 11-12 Knox). The truth he preaches does not come from any human source, but from God. And I'm not simply speaking of atheists and other non-church going people; even believing Christians have a problem with this. I remember Bill O'Reilly, who openly identifies himself has a practicing Catholic, having an argument on his program with someone about something that was taught by the Catholic Church, and calling this particular teaching a “rule” of the Church. Well, when you call something a “rule,” the implication is that someone in the Vatican decided to make this rule, and that, sometime in the future, someone else could decide to unmake the rule; that's how purely man-made rules work. That priests of the Latin Church cannot be married is clearly a rule of the Church, that we must fast for an hour before receiving Holy Communion is clearly a rule of the Church, that we must participate in Divine services on Sundays and a few other days during the year is clearly a rule of the Church. That one must be in the State of Grace to worthily receive the Blessed Eucharist is not a rule of the Church, it's Divine Positive Law; the Pope couldn't change it if it wanted to. The Church teaches it, but not because the Church invented the rule, but because she received that teaching from Christ. Now, you and I know this instinctively: when we go to confession and tell Christ, through his priest, that we missed Church on a particular Sunday, we do so because we recognize that as a sin; but it's only a sin because the Church says it's a sin; and, Christ has given his Church that authority: “Whatever you bind on earth shall be bound in heaven” (Matt. 16: 19 NABRE). If, on the other hand, we go to confession to confess that we murdered our mother-in-law, that, too, is a sin; but, it's not a sin because the Church says it's a sin, it's a sin because God says it's a sin: “Thou shalt not kill.” You and I understand the difference, but there are a lot of people out there who don't. To them, everything taught by the Church has the same authority. In their minds, the Pope could simply decide that abortion is moral just as he could easily decide one day to eliminate the Lenten Fast. That's the consequence of generations of Catholics whose knowledge of the world around them, and even of their own Church, comes primarily from television, which is not under the direction of people of faith. So, in returning to the Blessed Apostle Paul's opening salvo in Galatians—that the truth he preaches does not come from man, but from God—you can see how that statement, as simple as it sounds, is pretty loaded, probably even more so for us than it was for him. After all, he was first a Jew, then a Christian, who lived in an age of faith. We are Christians, too; but, we live in a very different world, a world in which the Grace and Providence of God is not presumed. And when someone approaches us, as happens from time to time, and asks us, “What does your Church teach about this?” it's incumbent on us to stop and think whether our answer, even if it's correct, may do more harm than good, depending on the words we use. Consider the question carefully: should our answer be, “My Church teaches this...,” or, rather, should it be, “My Church teaches nothing about this, but Christ, through His Church, teaches this”? * According to the menaion of the Greek Church, Hierotheus was one of the nine counsellors of the Areopage, was converted by the Apostle Paul who consecrated him Bishop of Athens, and was present with the Apostles at the Dormition of the Mother of God. ** In the Churches of the Byzantine Rite, the "Lucan Jump" is in effect for this and the following weeks through most of December. Cf. the footnote attached to the post here for an explanation.